Once upon a time, there was a nice lady named Gussie Morgan. Gussie worked in the special education office as a secretary, and she proudly served on her CSEA chapter executive board as Secretary. During the holiday season, Gussie and her coworkers wanted to help others in their community, so they contacted charities and community service organizations to find out what was needed. Over and over, they were told that people donate clothing and shoes, but never socks or undergarments. 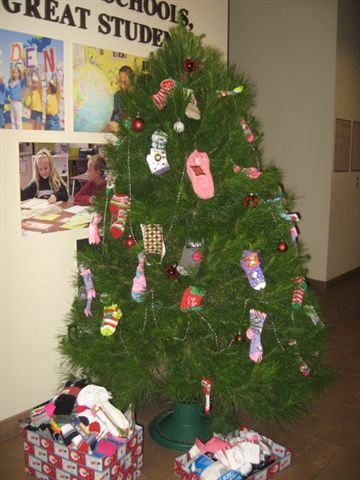 The special education office organized a sock drive, and at some point over the next couple years Gussie had the idea to hang them on a tree. Gussie retired in 1988, but CSEA has not forgotten her. To this day, the Chapter executive officers get a live tree to decorate the District office, and hang donated socks on it. Right before Christmas break, the tree is delivered to a family in our area, and the socks are taken to a charitable organization. Over the years, we have worked with HIS House, Victory Outreach, and our own McKinney/Vento program (for homeless students & their families). by the Board Room (warehouse building). If you have any questions, please call Cheryl in Accounting at ext. 82425. This entry was posted on Wednesday, November 28th, 2012 at 6:26 pm and is filed under Articles. You can follow any responses to this entry through the RSS 2.0 feed. Both comments and pings are currently closed.